Trip log 5075 mi. 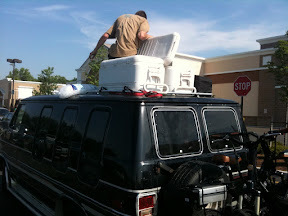 Here's Jack loading ice into the shaggin' wagon for tonights Phish show at Camden. As you may know our main van threw a rod on the way across the country to Phish tour in Rawlings, WY. We just talked to the mechanic yesterday, he originally said about 2 weeks about a week ago. Well, yesterday he says it's gonna take another 2 weeks from this point and it may cost over $1000 more than originally quoted. They also want a $1500 deposit or something like that. We have over $8000 worth of tv, and audio video equipment right in the van. That should be more than enough of a deposit because they will steal all that if we don't pay for the van. You know how mechanics are.